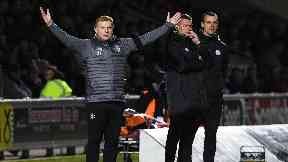 Lennon criticises supporter after loud bang heard near end of win over St Mirren. Neil Lennon has criticised the Celtic supporter who threw a firecracker onto the pitch during his side's 2-0 win at St Mirren. A loud bang was heard shortly after Ryan Christie scored Celtic's second goal on Wednesday night. It unsettled St Mirren goalkeeper Vaclav Hladky, and his manager Oran Kearney even admitted he was tempted to take his players off the field. Police confirmed they were investigating the incident and said they would liaise with the clubs. Lennon said: "It serves no purpose in a football ground. I don't see the motivation for anyone to bring a flashbang or pyrotechnic into a stadium. "The health and safety of the players and officials is paramount. It didn't just spook the St Mirren keeper but some of our players too. "Ryan was also spooked and the goalie might have burst an ear drum. "It delays the game when we have scored a goal and want to get going again. It serves no purpose whatsoever. "The club have made a real stand in condemning it at times. I don't understand why people want to do that. There is no logic in it. "Why does an individual want to bring that to a game? It doesn't impress anyone, it doesn't add anything. "It just damages people - and it could have damaged a player. It damages the reputation of the good fans we have and we just don't want it. "It's just totally uncalled-for at a time when we should be enjoying football and hopefully having a big (title) celebration in a week or two." Kearney said the firecracker had made him jump and was thankful no-one was hurt. He said: "It is mad to think of how that possibly could have ended up. You are tempted to walk your team off the pitch. "We are hopeful that thankfully it hasn't ended up more sinister than it could have. A Police Scotland spokeswoman said: "Police Scotland will liaise with the clubs and carry out a full investigation."